A long time ago, when FDW (husband) was in the Army, we spent three years in Germany. Because he played on every team the Army base fielded, we did more traveling than we might have. I think I saw every baseball and football field in Europe as well as the inside of every gym and bowling alley. Thankfully, we were able to take some side trips. Austria was my favorite country. Jump ahead a couple of decades when our son played hockey. Our club hosted an Austrian team, and we housed the players. Hartmut, Harte to us, ended up spending several days with us. He and I grew close and became pen pals. Jump ahead many more years and FDW and I finally got back to Europe. We chose Austria because of fond memories, and also because of our friendship with Harte. 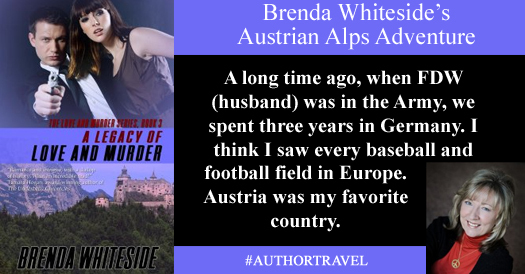 We stayed with Harte and his family in their centuries-old three-story home, and I fell in love with Austria all over again. Where to start with why I love the country? It’s the food, the Alps, beautiful old churches, the food, cobbled streets of ancient cities, picturesque castles, the food, and so much more. Did you know you can sunbathe in the snow? They do that in the Alps. Did you know the Austrian language is actually German? The countryside is pristine with lakes and green meadows then suddenly there’s a hill with a castle at the top. Beyond the exquisite landscape, the main draw, other than the food, is the people. What friendly, warm, beautiful people. When we arrived in Austria, it was the first time we’d met Harte’s parents. Because it was our wedding anniversary, they gave us the use of their cabin in the foothills of the Alps complete with wine and food. This is so typical of the Austrian people. Harte was our personal tour guide taking us to castles and churches, as well as shopping in Klagenfurt. Little did I know then, that the city would be the setting for A Legacy of Love and Murder, years later. Nor did I know one of the castles we toured would be the model for August’s inheritance. So, when I decided to write my Love and Murder Series, my heroine in the first book, The Art of Love and Murder, found out her birth father was Austrian, and she was going to inherit an Austrian castle. A Legacy of Love and Murder, book three, is set in Austria. Lacy, from book one, and her daughter, August got to take the trip, and I got to vicariously enjoy Austria again. Harte helped me with the language I needed for my book as well as other details of which I wasn’t sure. My memories for the area and my fondness for the people, shine through the story of suspense and romance. If you have the chance to visit Europe, don’t miss Austria…or the food. Inheriting an Austrian Castle is an Alpine fairytale for August, until someone begins killing the heirs.